The details for this Band were quite stationary for some time until I was contacted by the Grandson of Alexander Chalmers. This information has been greatly updated and photos added. 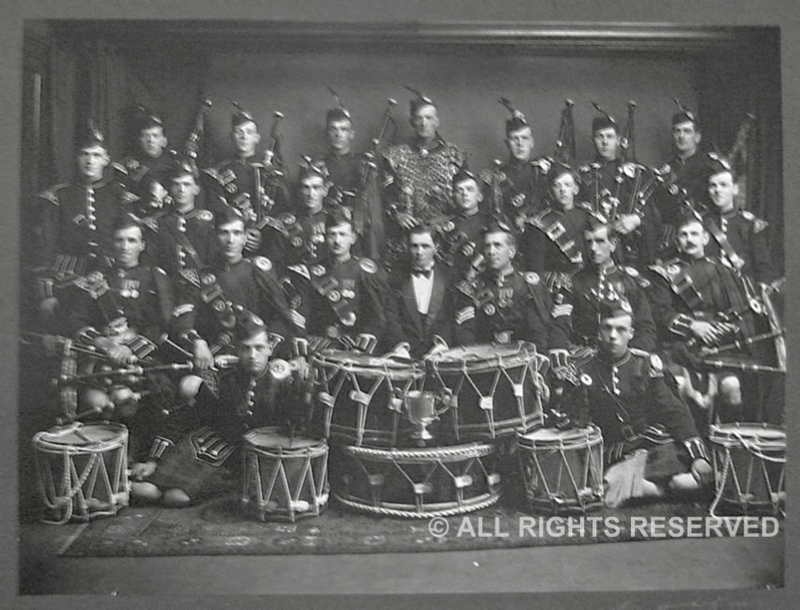 The City of Dundee Prize Pipe Band was formed in 1919 by Alexander "Sandy" Small Chalmers returning service with the meant coming from World War One with the Black Watch. 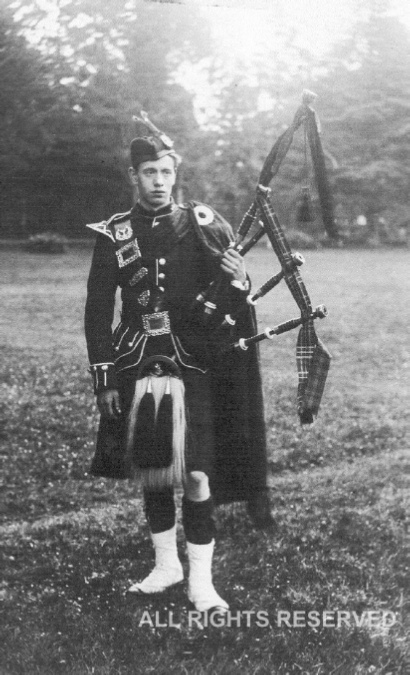 The other founder was Willie Rodger Salmond, who became their first Pipe Major . the (army) Gordon Highlanders and even the Cross Belt still has the "Gordons" crest on it. 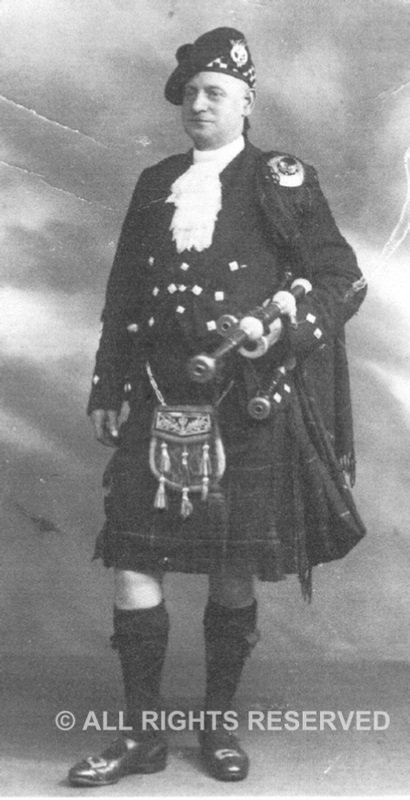 Originally a member of the Caledonian Pipe Band before World War 1, Sandy formed this band in 1920 out of the remnants of "The Dundee Pipe Band" and Willie Rodger Salmond was the first Pipe Major owing to his vast experience. Once things were up and running, Sandy himself took over the reins. With five years of hard work, it was decided that the band was good enough for a public performance and they competed, unsuccessfully, at Comrie Games. This turned out to be the start of a very successful lifespan, and the band went on to win a number of honours, and even managed to win the Dundee City Police Sports Cup on three successive years. Sandy got to keep it. 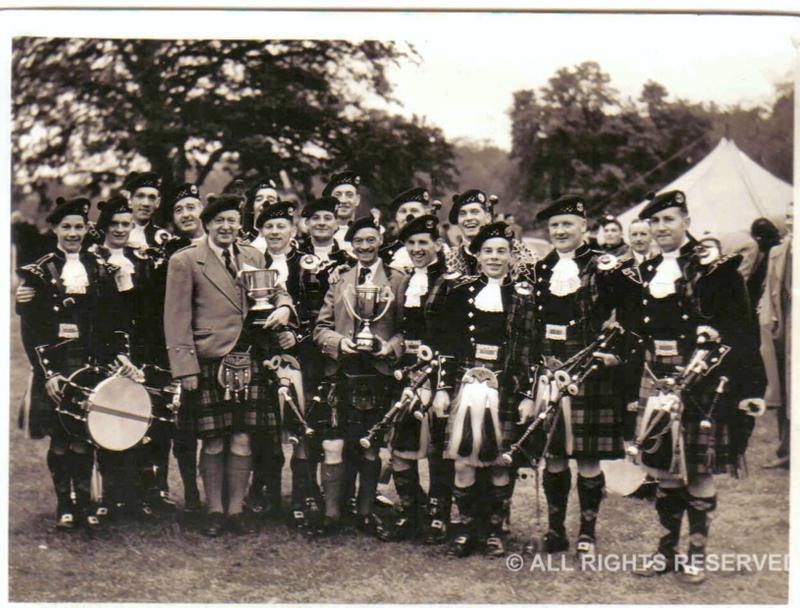 The Police sports was a very highly thought of event, and had bands from all over the country competing for the title, with names including the Dundee, Glasgow and Edinburgh Police Bands, The MacLean Pipe Band (Glasgow) and Shotts and Dykehead Caledonia. To win this was indeed a feather in their caps.............But three in a row? 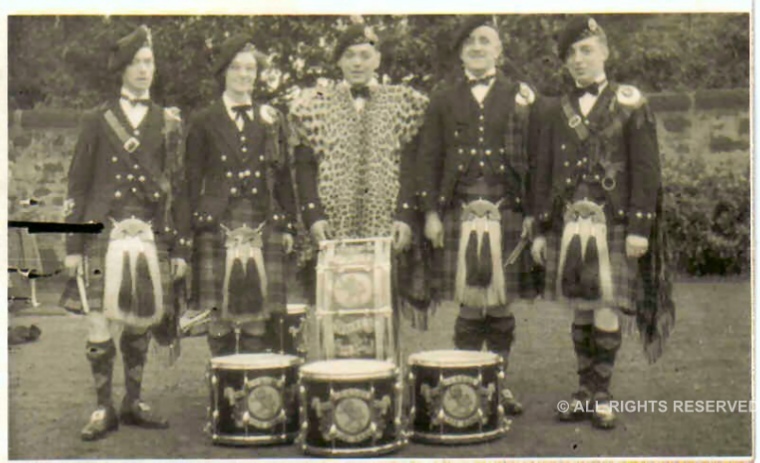 I personally remember in the 1980's being presented with the Braemar shield and was amazed to see how many times this band appeared on it in the 1930's. 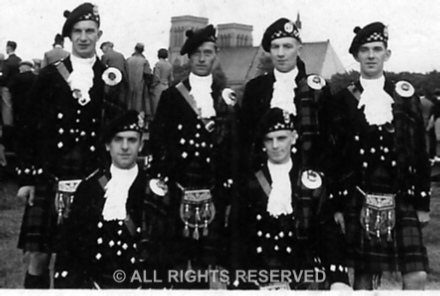 Between 1935 &1939, the City band changed their tartan to the Red Wallace with the purchase of their new uniform. Sandy Chalmers was quite a patriotic man, and a great admirer of William Wallace, hence the choice of tartan. The cost of the new uniform, according to a news paper cutting, was £268. Their highly successful period seemed to be over and superstition suggested that the change of tartan was unlucky. I tend to think that the highly skilled army pipers of the First War were beginning to thin out and the reconstruction of the Pipe Band world was oncoming with the formation of the Scottish Pipe Band Association. Perhaps the power base of Piping even then was moving west to Glasgow. Sounds familiar? Where are the violin cases "Youz Guys"
Front Row L to R Sandy Chalmers, Will Allardyce, Jock Crabbe, Dave Paton. 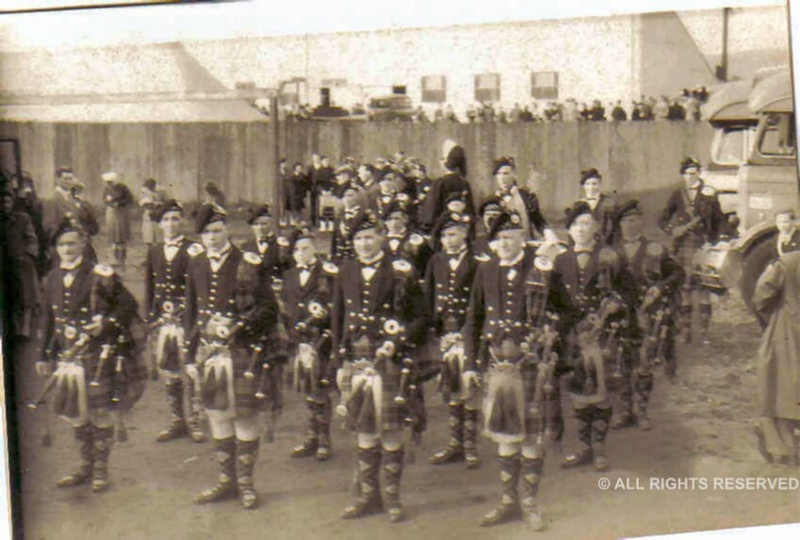 The next photograph shows the 2nd Battalion, City of Dundee Home Guard Pipe Band in City Square, Dundee, around 1945. 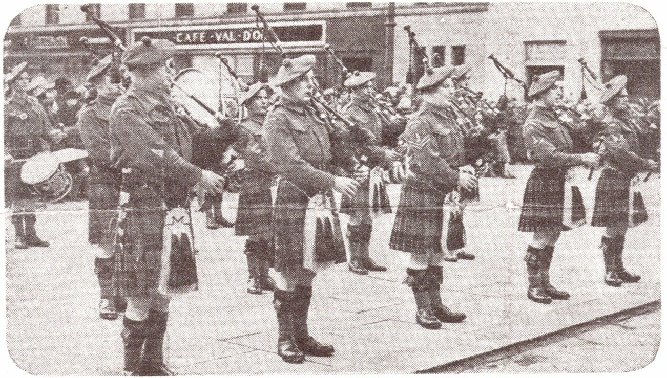 In the main, this was the "City of Dundee" band, but the Battalion included members from other local Bands. They are by now wearing their Wallace Tartan kilts together with their Battledress Blouses. centre of the front row and Sandy Robertson senior is on the far left flank (right of the picture). worn with a Prince Charlie style jacket and waistcoat, short plaid, Balmoral and buckled shoes. This is shown in our last photograph of Sandy Chalmers. The sporran in that photograph doesn't fit in, but the photo was taken on his retiral as Pipe Major and he may have worn his own for the occasion. In all honesty, it has to be noticed that Sandy Chalmers was one of a rare breed of pipers. He was taught as a child, joined the local Caledonian band, went on to form and teach a highly skilled and successful team of musicians. Add to this that he was a founder member of the Dundee, Perth and Angus Pipe Band Association and then went on to help this to join with Glasgow to form what is now The Royal Scottish Pipe Band Association. Here we have a photo courtesy of Ron Miller. 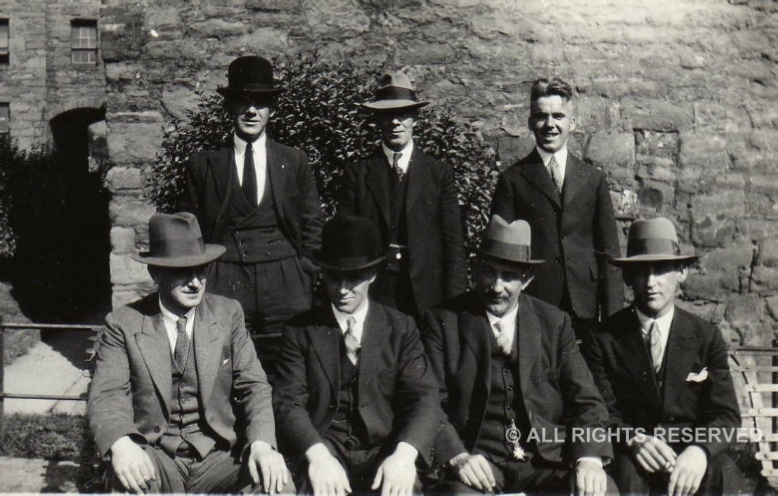 The only name we have for the group is Ron's uncle David Miller (standing second from the left). A super quality photo possibly taken after the Second World War. Having spent some time with the pipers, it is worth remembering that a highly notable member was in fact a drummer. Highly thought of all his years was David Miller. Safe to say that David was a highly inventive, as well as highly skilled drummer. It has been suggested that he was in fact the Alex Duthart of his day. His son, Claude, was to follow in his footsteps, but took things a bit further by becoming a highly accomplished Piper and highland dancer. David's family is still to the fore throughout the local Pipe Band Branch with nephews still active in the drum corps. David Miller is on the left here with a lady drummer Allie Lesley, I need the name for the Bass drummer, George Black senior is next, but who is the last one? David Miller on the left, Allie Lesley (female), unknown Bass, George Black senior and unknown. This next picture was taken with the old stand at Cowal Games in the background. In the above photo we the City are holding on to the "Sentinel" Cup (right), but what was it for? The trophy on the left is the Dundee Police Sports Cup which was won three times in a row by the band and is still held by the family of Pipe Major Sandy Chalmers. Help me fill the spaces.